Good morning this is Chief Science officier Jennifer Sontag reporting from the science lab aboard the USS Tiburon currently in route to a new planet that was recently discovered by a our long range scanners. We have a bit of a wait until we get there so the captain has asked me to do put together a report for the USS Tiburon detailing on my special ongoing projects in the science lab. As you all know by now my lab is currently working on my fellow science officers are working on making the Tribbles that currently reside in the lab a easier to work with and so they won’t multiple by the thousands and cause chaos. First I would like to like to thank some of my research assistents for thier hard work in compiling this report for the Captain, I don’t know what i would do without them, espicially my head reseracher Gene Rodenberry, with him I would have never gotten this far with my project. Ok now for the fun stuff, as we all know that many years ago Captain James T. Kirk was asked to go Space station K7 tohelp with the delivery of quadrotrticale grain to a planet called Sherman’s planet. Upon arriving to the station the ships crew was granted shore leave and LT. Uhura and LT. Chekov went into the spacestaion to do some shopping and thats were the trouble started. 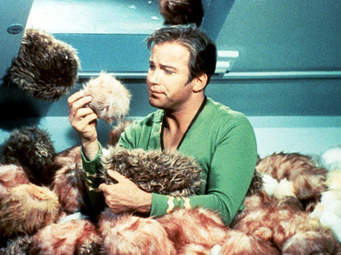 They encountered Cyrano Jones and his newly acquired acquisitions Tribbles. 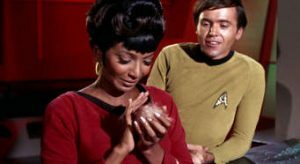 Of course Uhura was taken in the gentle cooing that the tribbles make and thats were were the fun started. The tribbles infliterated all the areas of the Enterprise and with the help of LT. Commander Scott they beamed the whole tribe onto the Klingon ship before they beamed out. Ok enough of the history now for the fun facts. Tribbles are fairly small ranging from the very small about 3 cm all the way up 35 cm. They come in a variety of diffenrent colors ranging from the ordinary browns and blacks to calico and if you are very lucky you might find a rare one with the coloring of cotton candy. The tribbles have a very high metabolism rate and they are constantly hungry and in search of food, just ask the curator of the grain on K7. They are also born pregnant which is why they are banned on most planets. 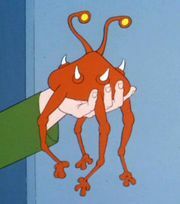 Luckily (not so much for the Tribbles) the Klingons (whom the tribbles hate) have come up with glommer whichh is a tribble devourer. So the captain has put a coupleof those around my lab just in case. make sure they are in fully enclosed enclosure because they are escape artists and make sure they have adquete food and water. they are always hungry so make sure they are always have food. They are mostly vegtariens and should be fed veggies with low energy grain thrown in for variety. You can also find some good quality tribble grain mixtures in pet stores. Your tribble craves attention so give it all you can. They love to be petted and held and make a soothing cooing sound that tells you the Tribble is happy. And if you happen to be around any Klingons your Tribble will make a high pitched squeak. If you are traveling to other worlds be sure that you have you have the proper paperwork or your Tribble might be confisacted. The only safe Tribble that can be transported are the non-breeding variety. And last but not least for all you Klingons out there that might want to own a Tribble, unforunately you may not own one because it’s illegal to. The Federation has said if a Klingon owns a tribble it’s to stressful for the tribble. Whew that was alot of information for a small post but I hope it was entertaining and you learned a little more about the Tribbles. And if you are looking for one of your own please try and find an adoption agency, they have many great Tribbles up for adoption and they get many more each day. I know that the USS Tiburon will be holding an event in June at a covention called Denver Comic Con, please stop by and adopt. Well TA TA for now, catch you next time.